This virtual class defines the interface of any object accepting drawing primitives on it. For an example of each font check the corresponding wiki page. Definition at line 40 of file CCanvas.h. Definition at line 116 of file CCanvas.cpp. Definition at line 64 of file CCanvas.h. Definition at line 355 of file CCanvas.cpp. References int(), line(), M_2PI, and mrpt::utils::round(). References mrpt::utils::CImage::getHeight(), mrpt::utils::CImage::getWidth(), mrpt::utils::CImage::isColor(), MRPT_END, MRPT_START, and setPixel(). References getHeight(), getWidth(), min, and setPixel(). Implemented in mrpt::utils::CImage, and mrpt::utils::CEnhancedMetaFile. Referenced by filledRectangle(), and line(). Reimplemented in mrpt::utils::CImage, and mrpt::utils::CEnhancedMetaFile. Definition at line 125 of file CCanvas.cpp. References getHeight(), getWidth(), int(), MRPT_UNUSED_PARAM, setPixel(), and mrpt::math::square(). Referenced by cross(), drawCircle(), mrpt::slam::CMetricMapBuilderRBPF::drawCurrentEstimationToImage(), rectangle(), and triangle(). References init_fonts_list(), m_selectedFont, and m_selectedFontBitmaps. Referenced by mrpt::utils::CImage::drawChessboardCorners(), and textOut(). Pixel coordinates starts at the left-top corner of the image, and start in (0,0). The meaning of the parameter "color" depends on the implementation: it will usually be a 24bit RGB value (0x00RRGGBB), but it can also be just a 8bit gray level. 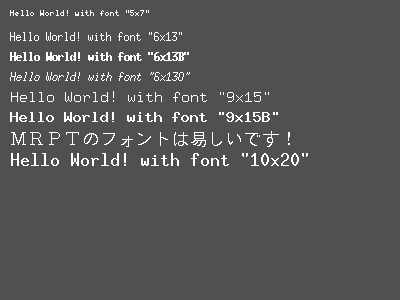 You can also use a TColor() type as input and it will be automatically converted to size_t. This method must support (x,y) values OUT of the actual image size without neither raising exceptions, nor leading to memory access errors. Referenced by drawImage(), filledRectangle(), line(), and textOut(). References mrpt::system::decodeUTF8(), mrpt::utils::CImage::isOriginTopLeft(), m_selectedFontBitmaps, MRPT_END, MRPT_START, selectTextFont(), and setPixel(). Referenced by mrpt::utils::CImage::drawChessboardCorners(), mrpt::gui::CDisplayWindow::plot(), and mrpt::maps::COccupancyGridMap2D::saveAsBitmapFileWithLandmarks(). Referenced by selectTextFont(), and textOut().